A substantial, beautifully proportioned five bedroom detached family home with a self- contained three bedroom annexe, swimming pool complex and stunning landscaped gardens located in a prestigious and highly sought-after private road close to Otford village centre, and within walking distance of Otford main line station. This impressive four/five bedroom property has the added benefit of an attached, yet totally self-contained three bedroom two storey annexe with its own private entrance, garden and parking. The stunning south facing landscaped gardens that surround the property are further complimented by a bespoke Norwegian Pine Pool House Complex with a heated pool, changing rooms and covered seating area, ornamental ponds, manicured lawns, covered seating areas, and tiered levels with breath taking views over surrounding countryside. The property is approached via electric sliding five bar gates with a sweeping a semi- circular drive to a double garage ample off road parking and car port. Ground Floor. Impressive Reception Hall with a central two way staircase rising up to the first floor galleried landing and external balcony, Study, Cloakroom and Shower Room, Dining Room, Double aspect Sitting Room, Kitchen/Breakfast Room, Utility Room with access to Garage and Workshop, Conservatory. First Floor, Master Bedroom with walk out balcony and full 'en suite' Bathroom, Family Bathroom, and Three further Bedrooms and a Games Room which accommodates a full size snooker table. Gas central heating, 'A' rated Boiler. Central Vacuum System. Water filter and Water Softener. Security System. Double Glazed. Private side entrance. Largely open plan ground floor with: Study, Cloakroom¸ Utility Room, 'Dove White' Wren fitted Kitchen with 'Bosch' appliances, open plan to Dining Room and Sitting Room with access to private garden area. 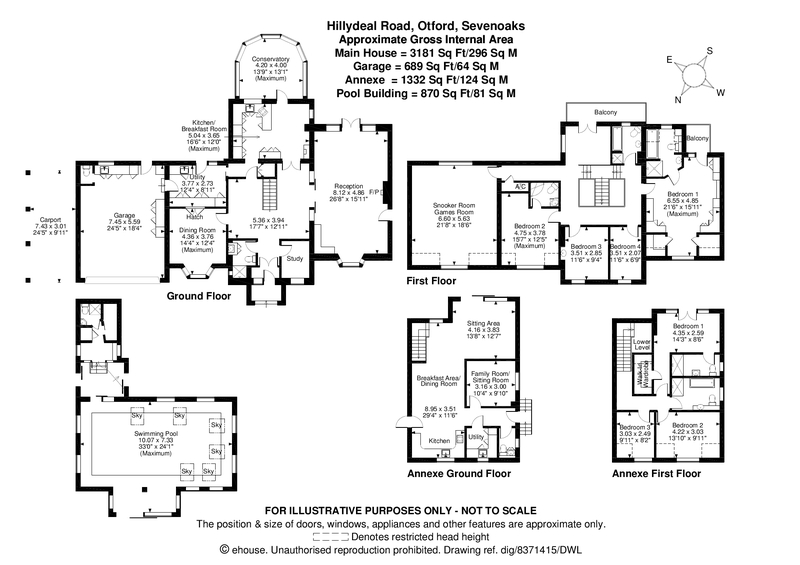 First floor with 'en suite' Master Bedroom, Juliet Balcony, and Two Further Bedrooms. Family Bathroom. 'A' rated Boiler, independent from main house. Gas central heating. Double glazed. Independent electric supply and water supply. Front Electric sliding five bar gates. In and out drive. Gravel parking area Specimen trees and shrubs. Side access. Car port. Ornamental pond with filter. Rustic timber bridge over pond. Seating area. Power points. Outside taps. Brick built front porch. Courtesy lights. Porch Solid wood door front. Window to front. Carpet as fitted. Part glazed double doors to hall. Reception hall Carpet to hall stairs and landing. Two way central stairway rising to first floor galleried landing. Radiator. Study Window to front. Carpet as fitted. Radiator. Cloakroom Window to side. Dado rail. Part tiled walls. Low level WC. Wash hand basin in vanity unit. Radiator. Carpet as fitted. Shower cubicle. Dining Room 4.36 x 3.76 (13'3" (4.04m) x 12'4" (3.76m)). Splay bay window to front. Carpet as fitted. Skirting board heating. Sitting Room 8.12 x 4.86 (26'8" (8.13m) x 15'11" (4.85m)). Double aspect. Sliding double doors to hall. Splay bay window to front. French doors to garden. Side windows. Wall lights. Fitted shelving and cupboards. Brick fireplace. Skirting board heating. Fireproof door to annexe. Kitchen 5.04 x 3.65 (16'6" (5.03m) x 12' (3.66m)). Window to side. Window to rear. Part tiled walls. Solid oak kitchen units, dresser unit with display cupboard, larder unit, 'Creda' double oven and grill in housing. Granite worktops with cream inset ceramic sink and drainer, units below. Four ring gas hob with light and extractor above. Integrated full height fridge, integrated dishwasher. Breakfast bar. Open plan to Conservatory. Conservatory 4.20 x 4.00 (13'9" (4.2m) x 13' (3.96m)). Fully glazed on low brick wall, central pitched roof with fitted blinds and central light and fan. Window blinds. Carpet as fitted. Double doors to side patio. Utility /Laundry Room 3.77 x 2.73 (4'4" (1.32m) x 12'4" (3.76m)). Window to rear, door to garden. Full wall of fitted base units with work tops above. Single drainer stainless steel sink unit. Wall storage units. Space and plumbing for washing machine. Space for dryer. Sliding door to hall. Door to double garage. Inner Hall Carpet as fitted. Window to rear. Airing cupboard housing hot water cylinder. Games Room/ Bedroom 5 6.60 x 5.63 (21'8" (6.6m) x 18'6" (5.64m)). Currently used as a games room. Double aspect with deep bay windows to front and window to rear. Carpet as fitted. Wall lights. Radiators. Beamed ceiling. Dado rail. Master Bedroom 6.55 x 4.85 (21'6" (6.55m) x 15'11" (4.85m)). Deep bay window to front. Doors to rear and walk out balcony. Carpet as fitted. Bedroom furniture, side wardrobes, bed recess with storage above, angled fitted wardrobe and dressing table. Ensuite Bathroom Window to rear. Panelled bath with central mixer taps and corner tap. Hand held micro shower. Low level WC with concealed flush. Floating wash hand basin, mixer taps. Wall mounted mirror with side lights. Built in cupboard. Tiled walls. Vinyl floor. Extractor fan. Bedroom Two 4.75 x 3.78 (15'7" (4.75m) x 12'5" (3.78m)). Window to front. Carpet as fitted. Radiator. Bedroom furniture, drawer units, bedside tables, dressing table, wardrobe. Ensuite Celestial window to rear. Shower cubicle, corner wash hand basin in vanity unit. Low level WC. Tiled walls. Extractor. Bedroom Three 3.51 x 2.85 (11'6" (3.5m) x 9'4" (2.84m)). Window to front. Carpet as fitted. Radiator. Wash hand basin in vanity unit, recessed mirror and light above. Bedroom Four 3.51 x 2.07 (11'6" (3.5m) x 6'9" (2.06m)). Window to front. Carpet as fitted. Radiator. Fitted wardrobe. Family Bathroom Window to rear. Radiator. Pedestal wash hand basin. Low level WC. Jacuzzi panelled bath. Mixer taps and hand held shower. Shower cubicle. Tiled walls. Annexe Steps to covered porch. Solid wood door to side. Hall Radiator. Vinyl strip floor. Study Window to side. Carpet as fitted. Radiator. Cloakroom Window to side. Low level WC. Wall mounted mirror. Utility Room Space for washing machine, fridge freezer and drier. Full height storage cupboards. Wall mounted 'A' rated central heating boiler. Tribune high pressure hot water system. Single drainer stainless steel sink unit, base unit and work tops. Kitchen/Dining Room 8.95 x 3.51 (29'4" (8.94m) x 11'6" (3.5m)). Double glazed window to front. 'Wren' bespoke fitted kitchen with contoured base and wall units in 'Dove' white with charcoal worktops running above. Inset ceramic sink with mixer taps. Integrated 'Bosch' microwave, 4 ring gas hob, 'Bosch' double oven below. CDA cooker hood and extractor above. Integrated fridge. Kick board lighting. Vinyl strip floor. Open plan to dining room. Dining Area Window to rear. Vinyl strip floor Radiator. Stairs to first floor. Open plan to sitting room. Sitting Room 4.16 x 3.83 (13'8" (4.17m) x 12'7" (3.84m)). Sliding patio doors to rear. Radiator. Vinyl strip floor. First Floor Carpet to stairs and landing. Master Bedroom 4.35 x 2.59 (14'3" (4.34m) x 8'6" (2.6m)). Bi-fold doors to Juliet Balcony overlooking garden. Carpet as fitted. Radiator. Walk in wardrobe. Ensuite Window to side. Double shower cubicle with drench head shower. Heated ladder towel rail. Comfort height WC. Wash hand basin in vanity unit. Wall mounted bathroom cupboard. Bedroom Two 4.22 x 3.03 (13.10 x 9'11" (3.02m)). Window to front. Radiator. Carpet as fitted. Bedroom three 3.03 x 2.49 (9'11" (3.02m) x 8'2" (2.5m)). Window to front. Radiator. Carpet as fitted. Bathroom Window to side. Free standing white bath with central mixer taps and hand held shower. Wall fitted vanity unit with inset wash hand basin, water fall mixer taps, storage units, and soft close WC with concealed flush. Heated towel rail. Corner shower cubicle with hand held shower and drench head shower. Garden Side pedestrian access through double wrought iron gates. Car port to side. Access to Annexe. Double gates to side driveway. Spacious paved patio with inset planted areas. Pitched roof seating area with mature grape vine. Raised, tiered flower beds. Ornamental pond and waterfall. Pergola with mature grape vine. Steps to gently sloping central lawns and swimming pool complex. Rustic arch to covered seating area with light and power. Artificial grass. Ranch style fencing and screening hedges. Timber sheds. Side steps to upper lawn levels and wooded area. There are a number of specimen trees, shrubs and plants within this lovely landscaped garden, and the seating area at the top of the garden has outstanding views around the surrounding countryside. Norwegian Pine pool house with vaulted ceiling. Windows to all sides and opening skylight windows. Sliding doors to garden. Inside seating area. 33' x 24' heated swimming pool with cover. Side steps. Light and power. Sliding doors to side. Changing rooms. Pool pump and filters. Shower and WC. With access from utility room. Light and power. Hormann electric up and over doors to front. 'A' rated central heating boiler. Storage cupboards. Door to rear garden. Single drainer stainless steel sink unit. Base and wall units. Cloakroom with WC. Council Tax We are informed that the main house is in council tax band E and the annexe is council tax band D, you should verify this with Sevenoaks Borough Council on 01732 227000.